The mimetic muscles direct facial movements. Under the control of the seventh cranial nerve (CN VII), the movement of these muscles correlates with the communication of human thought, emotion, and expression. Loss of this capacity is disfiguring and dysfunctional. At rest, an unnatural relaxation of the eyelid, cheek, and corner of the mouth occurs. Movement accentuates disfigurement. The lack of function leads to dry eye, ectropion, and conjunctivitis. Furthermore, alar collapse, nasal obstruction, muffled speech, and drooling appear. Cosmetically, the face is asymmetric. The eyebrow, eyelids, cheeks, and lips droop. The frontal creases are lost, and the nasolabial fold flattens. Several techniques have evolved to correct these deficits, including dynamic techniques such as nerve grafting and muscle transposition and static techniques with fascial or alloplastic slings. [1, 2] Each technique has limitations. Each technique, however, provides some restoration of both form and function and can be used in combination to optimize results. See the image below. Three general categories for surgical techniques in facial reanimation exist: neural suturing and grafting, muscle transfer, and static techniques. These 3 techniques can be used either alone or in complementary combinations. 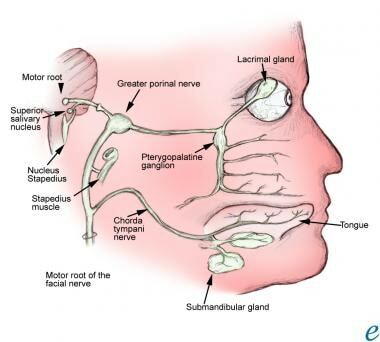 Establishing a treatment plan depends on the mode of facial nerve injury, resultant deficit, prognosis for recovery, and wishes of the patient. Nerve repair is a dynamic reanimation technique. Within a distinct time frame, direct nerve repair by suture or graft can lead to good results. Rehabilitation of the facial nerve and subsequent reinnervation of the mimetic muscles is achieved. Direct suturing of the nerve endings can be accomplished in laceration injuries (eg, traumatic, iatrogenic) and is best accomplished immediately after injury, before the development of fibrosis and scarring. Primary repair is not always possible, however, in the context of life-threatening injuries. Severed nerves can be identified with clips or suture (nonabsorbable) to assist in later identification and repair. These techniques are employed when direct suturing to the nerve trunk cannot be achieved without tension or following ablative procedures or trauma with resultant segmental nerve deficits. Donor sites for cable grafts include the great auricular nerve at the Erb point, the sural nerve, or the cervical plexus (C3, C4). Nerve crossover is another method for restoring function and is typically attempted with CN IX, XI, or XII. Crossover is useful, especially when the peripheral branches are intact, and the main trunk of the facial nerve is inaccessible. Muscle transfer also is a dynamic reanimation technique. The use of muscle transfer is particularly useful with atrophy of the mimetic muscles and/or facial fat. Transfer of muscle can be accomplished in combination with neural grafting. Several different regional transfers have been described, but the masseteric and temporalis transfers remain the workhorses in muscle transfer techniques. Other regionally transferred muscles include frontalis, platysma, sternocleidomastoid, and trapezius. The masseteric transfer provides reanimation of the lower face with separate muscle slips sutured to the upper lip, oral commissure, and lower lip. The temporalis transfer allows correction at the orbit as well, or it can be used for restoration of the lower face. In each procedure, the muscle is divided into slips and is attached to the submucosa or subdermis. Overcorrection is necessary to achieve satisfactory results, especially at the corner of the mouth. Within 3-6 weeks, the overcorrection resolves. The scalp defect after temporalis harvest can be corrected with an implant placed at the time of muscle transposition. In a 1995 report, Cheney describes harvesting the midportion of the temporalis muscle, then tightly suturing the residual muscle fascia to close the defect. In his hands, this obviates the need for an implant at this site. Others have not reported the same experience. Microvascular free flaps provide another dynamic technique for facial reanimation. The free flap is often used in combination with a nerve crossover technique. Donor muscles include the extensor digitorum brevis, gracilis, latissimus dorsi, pectoralis minor, and serratus anterior. The advantage of free muscle transfer over regional muscle transfer has not been established. The various etiologies of facial paralysis can be classified into 3 major groups, ie, intracranial, intratemporal, and extracranial (see Relevant Anatomy). Regardless of the cause, the importance of establishing the degree and duration of weakness when evaluating a patient must be emphasized. An appreciation of these factors, along with the level of deficit at rest and level of dysfunction, are paramount to establishing an individualized treatment plan. Certainly, the goal of surgical intervention is to achieve an aesthetic appearance at rest, while contributing to sphincter control—ocular, nasal, and oral. Several contraindications to dynamic facial reanimation exist, as follows: (1) absence of facial nerve branches or mimetic muscles of the face, (2) swallowing dysfunction, (3) denervated or excised temporalis and/or masseter muscles, and (4) compromised facial vasculature. Static reanimation can be accomplished with fascia or alloplastic material. Static reanimation allows for repositioning of the tissues that are affected by the pull of gravity. Resuspension by sling with multidirectional traction helps compensate for the complex contractions of the facial mimetic muscles. Furthermore, static reanimation may be an option for the debilitated patient who cannot withstand a longer operative procedure such as microvascular free flap or neural grafting techniques. May M. Facial paralysis, peripheral type: a proposed method of reporting. (Emphasis on diagnosis and prognosis, as well as electrical and chorda tympani nerve testing). Laryngoscope. 1970 Mar. 80(3):331-90. [Medline]. Langille M, Singh P. Static Facial Slings: Approaches to Rehabilitation of the Paralyzed Face. Facial Plast Surg Clin North Am. 2016 Feb. 24 (1):29-35. [Medline]. Citarella ER, Sterodimas A, Green AC, Sinder R, Pitanguy I. Use of triple-convergence polypropylene thread for the aesthetic correction of partial facial paralysis. Aesthetic Plast Surg. 2008 Jul. 32(4):688-91. [Medline]. Yu K, Kim AJ, Tadros M, Costantino PD. Mitek anchor-augmented static facial suspension. Arch Facial Plast Surg. 2010 May-Jun. 12(3):159-65. [Medline]. Costan VV, Popescu E, Sulea D, Stratulat IS. A New Indication for Barbed Threads: Static Reanimation of the Paralyzed Face. J Oral Maxillofac Surg. 2018 Mar. 76 (3):639-45. [Medline]. Chi JJ. Management of the Eye in Facial Paralysis. Facial Plast Surg Clin North Am. 2016 Feb. 24 (1):21-8. [Medline]. Henstrom DK, Lindsay RW, Cheney ML, Hadlock TA. Surgical treatment of the periocular complex and improvement of quality of life in patients with facial paralysis. Arch Facial Plast Surg. 2011 Mar-Apr. 13(2):125-8. [Medline]. Alam D. Rehabilitation of long-standing facial nerve paralysis with percutaneous suture-based slings. Arch Facial Plast Surg. 2007 May-Jun. 9(3):205-9. [Medline]. Alex JC, Nguyen DB. Multivectored suture suspension: a minimally invasive technique for reanimation of the paralyzed face. Arch Facial Plast Surg. 2004 May-Jun. 6(3):197-201. [Medline]. Biel MA. GORE-TEX graft midfacial suspension and upper eyelid gold-weight implantation in rehabilitation of the paralyzed face. Laryngoscope. 1995 Aug. 105(8 Pt 1):876-9. [Medline]. Brown JB, McDowell F. Support of the paralyzed face by fascia. JAMA. 1947. 135:18-22. Cheney ML, McKenna MJ, Megerian CA, Ojemann RG. Early temporalis muscle transposition for the management of facial paralysis. Laryngoscope. 1995 Sep. 105(9 Pt 1):993-1000. [Medline]. Coker NJ. Management of traumatic injuries to the facial nerve. Otolaryngol Clin North Am. 1991 Feb. 24(1):215-27. [Medline]. Conley J, Baker DC. The surgical treatment of extratemporal facial paralysis: an overview. Head Neck Surg. 1978 Sep-Oct. 1(1):12-23. [Medline]. Freeman MS, Thomas JR, Spector JG, Larrabee WF, Bowman CA. Surgical therapy of the eyelids in patients with facial paralysis. Laryngoscope. 1990 Oct. 100(10 Pt 1):1086-96. [Medline]. Hoffman WY. Reanimation of the paralyzed face. Otolaryngol Clin North Am. 1992 Jun. 25(3):649-67. [Medline]. Ibrahim AM, Rabie AN, Kim PS, Medina M, Upton J, Lee BT, et al. Static treatment modalities in facial paralysis: a review. J Reconstr Microsurg. 2013 May. 29(4):223-32. [Medline]. Kartush JM, Linstrom CJ, McCann PM, Graham MD. Early gold weight eyelid implantation for facial paralysis. Otolaryngol Head Neck Surg. 1990 Dec. 103(6):1016-23. [Medline]. Konior RJ. Facial paralysis reconstruction with Gore-Tex Soft-Tissue Patch. Arch Otolaryngol Head Neck Surg. 1992 Nov. 118(11):1188-94. [Medline]. Leventhal DD, Pribitkin EA. Static facial suspension with Surgisis ES (Enhanced Strength) sling. Laryngoscope. 2008 Jan. 118(1):20-3. [Medline]. May M. Muscle transposition for facial reanimation. Facial Plast Surg. 1992 Apr. 8(2):115-20. [Medline]. May M, Drucker C. Temporalis muscle for facial reanimation. A 13-year experience with 224 procedures. Arch Otolaryngol Head Neck Surg. 1993 Apr. 119(4):378-82; discussion 383-4. [Medline]. Okamura H, Yanagihara N. Multiple facial suspensions in protracted facial palsy. Auris Nasus Larynx. 1987. 14(2):105-13. [Medline]. Ozaki M, Takushima A, Momosawa A, Kurita M, Harii K. Temporary suspension of acute facial paralysis using the S-S Cable Suture (Medical U&A, Tokyo, Japan). Ann Plast Surg. 2008 Jul. 61(1):61-7. [Medline]. Snyderman RK, Ego-Acquirre E, Starzynski TE. The ultimate fate of freeze dried fascia: experience with its use in the correction of facial paralysis. Plast Reconstr Surg. 1966 Sep. 38(3):219-22. [Medline]. Spector JG, Thomas JR. Slings for static and dynamic facial reanimation. Laryngoscope. 1986 Feb. 96(2):217-21. [Medline]. Yoshimoto S, Sato N, Kuroki T, Rikihisa N, Ichinose M. Static reconstruction of malar region in facial paralysis: a new alternative technique for plasty of symmetric mouth appearance. J Plast Surg Hand Surg. 2013 Oct. 47(5):390-3. [Medline].